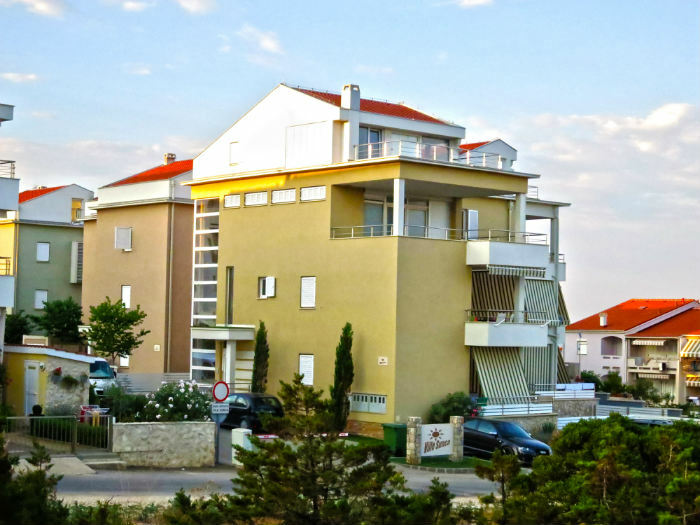 The "Ville Sunca" apartments are located in the western, peaceful part of Novalja - a secluded oasis of family tourism. They are very close (400 m) to the Babe sand beach famous for its warm sea and fine sand and the first beach is just a minute walk down below our estate. We offer 9 4+1 apartments for 5 persons max. Five apartments are on the ground floor, while four are on the first floor. All apartments have air-conditioning (cooling-heating), modern furniture, big screen plasma TV and large seaview terraces covered with awnings. The facility's large front yard also features a private parking secured with an automatic ramp. N +44° 33' 51" | E +14° 52' 17"